My name is Nicholas Hardesty. I've been Catholic all my life -- but not always a faithful or passionate one. See "My Conversion Story." In 2002, I graduated from Lindsey Wilson College with a B.A. in Human Services and Counseling. In 2004, I earned an M.Ed. in Counseling and Human Development, with an emphasis in Mental Health Counseling, from Lindsey Wilson College. In May of 2009, I earned an M.A. in Theology and Christian Ministry, and a Certification in Catechetics from Franciscan University of Steubenville. On October 24, 2009, my wife Amy and I were married. We have three children. I have a passion for the Catholic Church and a desire to help others to know and love Her better. This blog is my way of pursuing that end. The "phat" in my screen name comes from my association with Phatmass, a Catholic website and forum where where we "Preach Holy Apostolic Truth." When I decided in college to begin learning more about my faith, I quickly began entering into debates with Protestants at various forums and websites. Soon I had produced quite a bit of material in defense of the Catholic faith and I thought it might be good to have all of this in one place. Thus, my blog. This blog has also become my repository for links to awesome Catholic resources that are available online. There was a time when I was rather obsessed with scouring the internet in search of such things. My right sidebar is the fruit of that labor. When I first started my blog, it was focused almost entirely on apologetics. But, once I began work towards my theology degree and catechetics certification ... and especially once I became a DRE, my blog began to take on a more catechetical feel. My blog also has undertones of spiritual warfare (the caption, the pic of St. Michael the Archangel, the section of spiritual warfare prayers). This is because I truly believe that a person who engages in apologetics or catechesis is simultaneously engaged in spiritual warfare, in a battle against "the principalities, against the powers, against the world rulers of this present darkness, against the spiritual hosts of wickedness in the heavenly places" (Eph 6:12). Christians are at war with the father of lies. My hope is that through my blog, you will be equipped with the shield of faith and the sword of the Spirit, loins girded with the truth of Christ and His Church (cf. Eph 6:13-17). If you find an old blog post with font colors that make it hard to read, that's because I changed my blog design a couple of years ago and so posts that used to look right don't look right anymore ... and I can't ever seem to find the time to fix it. 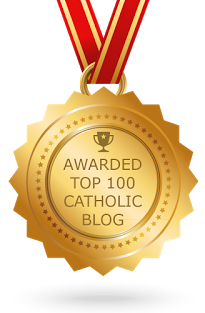 I used to blog very frequently, at least three times a day, but now that I am a professional catechist with a family, my blogging has become much more infrequent. I try to get a post in at least once a month. Have any questions? Leave a comment on one of my posts or use the "Catholic Q&A" form in my left sidebar. Oh, and one final thing: I end all my posts with "Pax Christi" because the Peace of Christ is what I need more than anything in my life. My hope is also that, through my meager words, I can extend that same peace to others.